Nana Dzagnidze was a terrific female chess player at a young age. 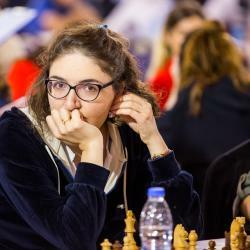 Even when her progress stalled for a few years, she came back strong and rocketed into the discussion of the best female chess players in the world. Now that she is the 6th highest rated woman in the world, she has affirmed her aspirations of becoming one of the best female players and has her sights set even higher now. Nana Dzagnidze learned to play chess when she was young and won the World Girls U-12 Championship in 1999. As she got older, she continued to improve her skills until she won the gold medal at the World Girls U-20 Championship in 2003. From the years 2003-2007 her progress stalled and she didn’t get much better at chess. This changed from 2008-2009 when she played a ton of chess and improved her rating a lot. It was at this time that she achieved her best rating ever and broke into the top 10 of best female players, becoming the eighth best in the world. She rolled these successes into 2010 when she won the women’s Grand Prix tournament in July. Since then she has achieved another highest rating, 2569, in August 2013 and is also now the 6th highest rated woman in the world.